Lavender is one of my favorite herbs. It comes in many varieties, colors and forms. While thinking about this article, I started with 10 ways to use lavender, but started to remember more and more. Now I’m up to 25! Rub lavender essential oil neat (undiluted) on your temples to ease a headache. You can also inhale the scent for the same effect. Add a few drops of essential oil to some warm water in a squirt bottle and shake. Disperse throughout your hair and rinse after a few minutes. Or you can drip a few drops on your brush and brush through hair. Add a few drops of essential oil to some water, shake well, and spritz your clothes and other fabrics, like curtains. The antibacterial action will kill germs and add freshness to fabrics. Add a few drops of essential oil to some olive oil and warm it slightly. Drop a few drops into the ear canal and let it sit. It will aid in the healing of infections. Lavender blends well with many other scents. I add the essential oil to oakmoss and patchouli for a clean, woodsy scent. Lavender is a natural mood elevator, and may help with depression. While lavender will elevate the mood, it also calms it. Try some lavender tea before bed or a few drops of essential oil on your pillow. This also works to calm babies. Dilute the oil at a 10:1 ratio. Mix it with a light oil like sweet almond or jojoba. Run a warm bath and add a few drops of the mixed oil. You can also add a few drops to the water when you wash the baby clothes. Lavender is known to help regenerate new skin cells. Add several drops of essential oil to your face cream or body lotion to help heal your skin. Its antibacterial action makes it particularly helpful with chronic skin problems such as acne. Lavender is antiseptic. Add a few drops to some warm water in a spray bottle and shake. Spray this on your kitchen counters to kill germs and bacteria. Lavender is anti-inflammatory. It helps relieve menstrual cramps if rubbed on the abdominal area. It can also help with the inflammation caused by hemorrhoids. Lavender can help relieve the pain and itching from insect bites. It can also help fight infection from them as well. Why let the bugs bite you first? Lavender is a natural insect repellent. Add some to your homemade insect repellent. Shake well and spray all over. Don’t forget your plants. Add several drops to a small spray bottle full of water and shake well. Spray on roses and other plants to keep the aphids off of them. You can also plant lavender in between other plants to keep the bugs away. Neither deer nor rabbits like the smell of lavender. Use the same spray as above to keep animals from munching on your plants. Inter-planting works here too. Infuse water with lavender and make ice cubes for a refreshing treat. For lavender ice cream, add flowers to milk and strain before adding to ice cream maker (or leave them in for a more conspicuous flavor!). Add lavender flowers to cookies for a interesting snack. Add fresh flowers to salads for a different taste. Boil some water and add to a large heat-safe bowl. Add a few drops of essential oil to the water and lean over to inhale the steam. Tent a towel over your head to catch as much of the steam as possible. For burns of all kinds, including sunburn, rub the essential oil neat over the burn. It will soothe, bring down inflammation and help to begin the healing process. Lavender essential oil, along with Vitamin E, will help to prevent scarring. This includes stretch marks. There is currently a study being done on older scars that involves lavender oil. It may also help reduce the appearance of older scars. Lavender contains compounds that will help clean wood furniture and add natural luster to the surface. Use lavender essential oil in your homemade wood dusting spray to give furniture a nice shine. Lavender is anti-fungal. It will help to kill molds and mildew and help keep them from reforming. I use it in a spray for the inside of my shower curtain because it always stays damp. Lavender flowers make a nice floral arrangement, whether fresh or dried. Lavender is a wonderful perennial shrub that lasts many years. Many varieties are disease and insect resistant, so they take little care once established. Lavender makes a nice option for protecting your clothes from moths if you don’t like the smell of cedar. Massage a few drops of lavender essential oil into your sore muscles. It will help relieve the pain and stiffness. Ok, so this one is not necessarily proven. A little history for you though – in ancient Rome, lavender was used in doorways to keep out evil spirits. This could be true, as it can help to lift the mood – so people entering a house would be happier. Could be…. For any of these uses, whether using it topically or eating it, it’s always important to find the best lavender possible. If using dried lavender, grow your own without chemicals, or find organically grown lavender for purchase at a Farmer’s market, local health food store, or online here. When choosing lavender essential oil, you’ll also want to be sure it is of the best purity and quality. We like the pure lavender essential oil sold here. Let us know how you’re going to use your lavender! I keep several sachets of lavender buds in my dresser drawers to keep them smelling fresh. I hang one sachet on my bed post and squeeze it gently to help me get to sleep. You could put lavender buds and hopps or another grain into a small “sleep pillow” as well. With respect to number 18 , what proportions do you suggest. Love your site, i check in daily. I love lavendar! For ear aches I put a few drops on a piece of cotton ball and put it in my kids ear (not too far in). It relieves the pain every time. Thanks Annette! That would be a good alternative for those who don’t want to put drops in their ears. I use lavender oil in my homemade bath salts, because the fragrance is so calming. Good article. Thanks! Thanks Diane! I love lavender and I think putting it in the bath in my favorite thing to do with it too. Isn’t fresh ginger supposed to be good for migraines? Yep, sure is, Dawn! Guess I should have scrolled down farther before answering the last question! I’m so sorry Liz. That can be a problem. You can try mint, like peppermint or spearmint. That sometimes works. Or try a ginger tea. Ginger is antispasmodic and can help with headaches. Watch for an upcoming article I’m doing on headaches. Hope it helps! I use a blend of baking soda and lavender essential oil on my mattress when changing sheets. Thump it into the mattress and leave it most of the day, kills those ugly little dust mites and microscopic things. Vaccuum before remaking the bed. Thanks Sylvia! I never thought of that! I spray my pillows when i change the sheets, but have never thought to mix it with baking soda and use it on the mattress. Thanks for the list, it reminded me of uses I’d forgotten and some I didn’t know! Thank you for reminding me about the laundry! I’ve used it as a fabric refresher, but forgot that I use to put it in my laundry when I wash it. Great info! I have a question. I was always told never to drop EO in your ears. Is it always safe to do suggestion number 4? Is there a reason why I was told that? Thanks! While it is true that you should never put anything in your ears, a thin film of lavender essential oil will coat the outer part of the ear canal on the inside and not get to the eardrum. I think mostly, you shouldn’t flood the ear, but just use a few drops. And never user a cotton swab or anything to administer it. Just drop it in, and the massage it around. I’m always learning something helpful from you. Thanks! Thanks Eve! We’ll keep it up! I read in today’s information on Lavender that you use it for an ear infection. Could that work for my Lhasa Apso dog’s ears? He has a chronic ear infection that appears every 3 months or so and the vets keep wanting to give him antibiotics which I am against and they don’t work anyway in my opinion. Could lavender be the answer? Love your website! I would love to know the answer also. My Golden Retriever constantly has ear infections and my vet costs is getting out of control. You can use lavender essential oil on dogs, though for an ear infection, I would mix it in a powder to help keep the ear dry. Put about 10 drops of oil in half a cup of cornstarch. It will form lumps , so just keep mixing it back in. It will also help repel ear mites and will probably stop and infestation. For ear mites, you might to mix some alcohol and essential oil. Alcohol will help dry out the ear and allow the oil to work. I use vodka since there is no smell, color or taste. You can use the oil by itself, but I’ve found it helps to have a carrier. What do you mix with the lavender to spray your shower curtain? 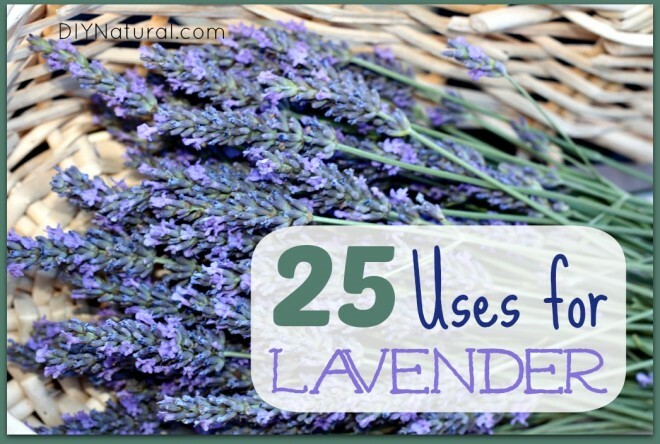 Thanks for all the great uses for lavender. I mic up a 24 ounce spray bottle with water, about an ounce of alcohol and 15 drops of lavender essential oil. I shake it up well, and then spray. The alcohol helps break up the oil and keep it suspended. This helps to keep the shower and curtain free of mildew and any bacteria you might have inadvertently brought home with you. I’ve never had a bout of athlete’s foot either, even with people coming to stay, and using the same shower. I do a daily injection for MS, which includes Heating the area first, injecting, then icing it. I use Lavender Essential Oil after the icing every single day. It soothes the sight, reduces pain, and just makes doing that darn injection….a whole lot easier. I’ve also used it on burns and scars. One time I was taking a loaf pan out of the oven, and caught the end of the pan on the counter top, and as I was putting it up, it caught, turned over and stuck to my lower arm. I had to shake it to get it off….yes, pain….but I grabbed my bottle of Lavender oil (that I keep in the kitchen…one in the bathroom, my car, my purse…It’s my TOP oil!) and rubbed it on immediately. Every time that stung, I rubbed oil on it….in less than 2 weeks, there wasn’t even a red mark. Lavender oil ROCKS!!! Thanks Donna! I actually went through a stage early on where I didn’t like it. Rebellion, I suppose! I turned my thoughts around really quick when I discovered how versatile it is. It’s one of my favorites now. I keep it in my purse, in my car and in about every room in the house.